vze1135 Carolyn. Please check your Inbox. The design is not being sold here. Lovely Shirlene, nice to see you here again. 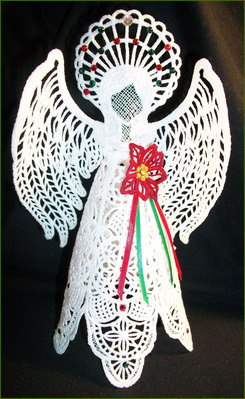 Wonderful angel; beautifully stitched. Merry Christmas to you. Thank you and Merry Christmas to you, as well. Nice to see your work again, Shirlene! Sue, thank you so very much. Shirlene.....as always, beautiful stitchout.....Merry Christmas to you & your family!! Vicki, thank you so much - Merry Christmas to you and yours. To sammi10: here is the link for this angel. I searched her site over and over again, can't find this angel or any way to purchase it, or actually any of her FSL designs to view, what am I doing wrong? Thank you Sammi, I see Lidia stepped in for me and you have the info. Wow she is gorgeous. I have the one from last year but I have not stitched it out yet. You may have just given me the inspiration to do so since I see yours is so well done. Thanks for sharing. Yes, a very lovly angel. I also,purchased this last year; but it takes around 6 hrs. to completely sew out. The head bends alittle, so I broke a narrow stick the length from head to bottom of skirt and glued it to the back of head. 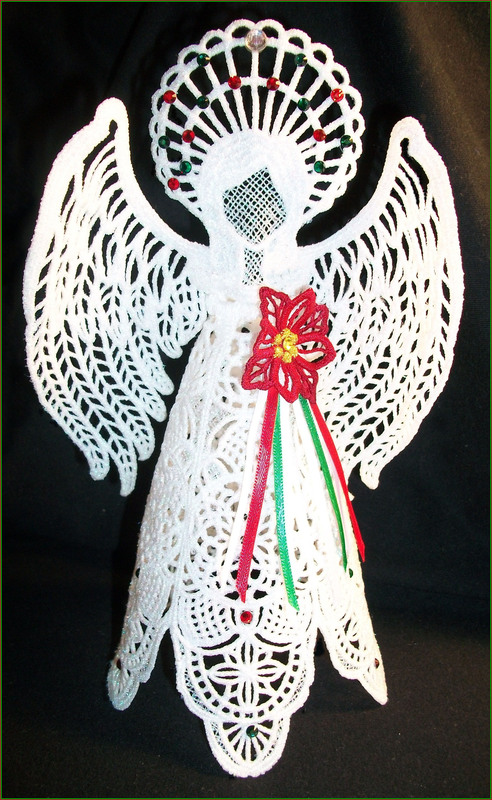 I have sewn 5 angels for gifts; decorated with stones, beads and glitter; and gave her in a special box to keep her. Everyone has said,she is special...Diane M.
Diane, so happy to hear that you have made so many - have you shared your pictures - I would love to see them - can you private them to me - if you already have shared or give me a link - so I can see them. I never had any trouble with the head - but I use a spray starch - that doesn't clump when I am molding them and it seem to help in that area - I also stitched the head to the skirt - to make it strudy - the tabs are on the inside! Thanks! Your angel is absolutely stunning! Love it. Beautiful, perfect and professionally made, as usual. Love it! Nice to see you posting, Shirlene. I wish you and your Hubby a Merry Christmas and a happy, better, New Year! Lidia, thank you so very much - Merry Christmas to you and yours. She is beautiful! Nice to see you are back with us and creating such beautiful angels! I do hope you and Rick will have a wonderful Christmas. May the wonder of the season bring you much peace and love along will better health! Linda, thanks so very much - what a sweet thought - I hope it comes true - wishing you a Merry Christmas, too. Thank you so very much - I had to get this one out - so I thought I would share it here, too. have never tried FSL before will pop it on my to-do list. This looks great, fantastic job. Kathy, thank you so very much. very beautiful Shirlene you do such a beautiful job. Lenamae, thank you so very much my dear. Laura, thank you my dear, I so appreciate that. Carolyn, thank you so very much - hugs. Shirley, thank you so very much - I do appreciate it. Soozie, thank you so much - I like that - magic! Thankyou my dear - the picture doesn't even do it justice. Sandra, thank you - you are always so sweet. she is beautifull ..thanks for the link..
You are very welcome - I try always to share the link - when I have it.